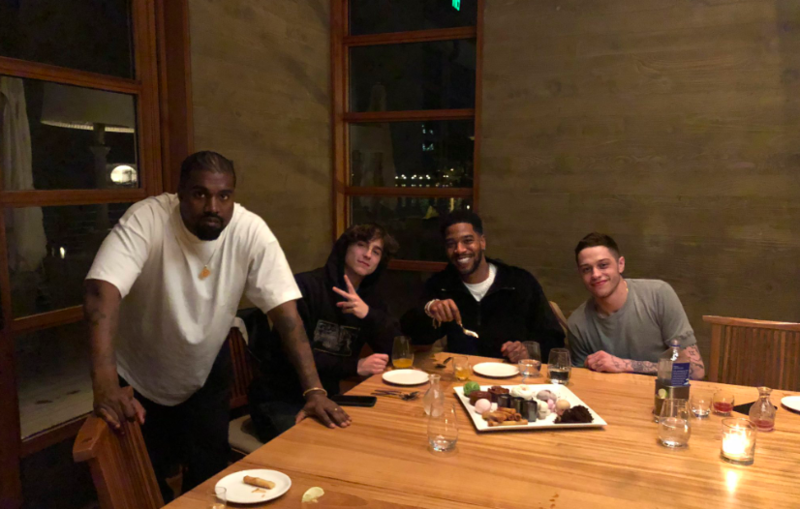 Kanye West, Pete Davidson And Timothee Chalamet Just Hung Out Together For This Person's Birthday - T.V.S.T. 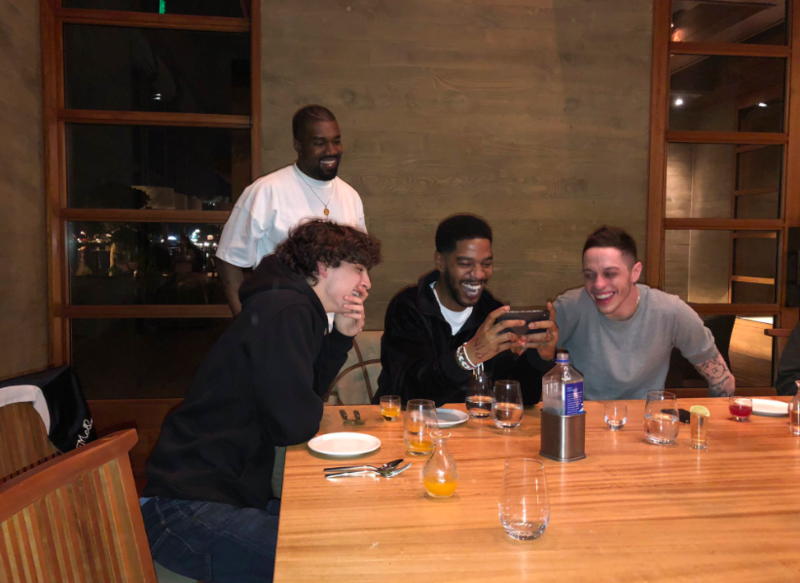 If you walk inside a room and see Kanye West, Pete Davidson and Timothee Chalamet, you might think you’re in some weird fantasy inside the mind of a confused 20-year-old girl. Or you might just be at a birthday party for Kid Cudi. On Wednesday night, Kim Kardashian shared a few snaps of what appeared to be a very intimate birthday gathering for the 35-year-old rapper. 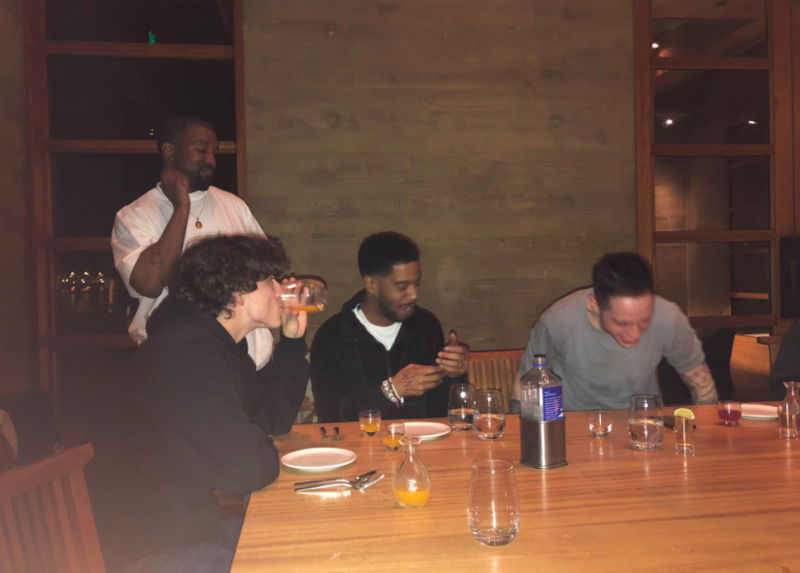 In the photos, Kid Cudi is sandwiched between Pete and Timothee while West stands behind everyone. They were all smiling and appeared to have a great time. What’s interesting is that all three dudes have expressed love for Cudi in public. During an interview with GQ, Timothee revealed he talked to Cudi for hours backstage at a concert in Montreal. He said Cudi gave him some of the best advice he’s ever heard. You see, Timothee came to him in a weird place. He felt like the walls were closing in around him, and he didn’t know what his next step should be. Cudi basically told him if you love this sh*t (the sh*t being acting) then you have to double down on it, “Are you, Timothee, the sort of person who can’t possibly live any other way? ‘F–k yeah,'” Timothee replied. He saved my life. I would’ve killed myself if I didn’t have Kid Cudi. If you’re 25 and under, I truly believe that Kid Cudi saved your life. I truly believe if Man on the Moon didn’t come out, I wouldn’t be here. And we all know about West’s professional collabs with Cudi, so yeah, everyone at this party had a strong connection to the artist. Will Pete, Timothee and Kanye ever hang out together without Cudi? Uh, probably not, but it’s cool they can all put their differences aside for one night and have fun together.